It appears that just to travel by train seemed brave and worthy of respect. The Bristol Times and Mercury observed that the Midland Railway directors and leading officials were not at the opening and seemed not to like the branch. It also commented that if they (the directors) had attended, a celebratory luncheon would have been held. “Unless time is an object it is very probable that this (travelling by bus and then train) will continue to be a favourite route for it is not only a pleasanter but cheaper journey”. The Society of Thornbury Folk article says that the Tockington Band in its uniform led a ”large concourse” of people up the High Street from “The Swan” to welcome the first train at 10am. The Times and Mirror grew more enthusiastic later in its report. 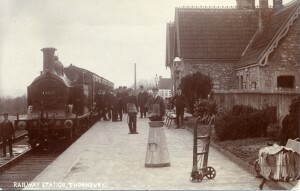 The Society of Thornbury Folk Bulletin number 6 of September 1948 mentions that Mr F H Burchell gave an address about the opening of the line and in the discussion that followed it was recalled that when the railway first opened in 1872 Edgar Pitcher was one of the people to get a free ride in the train.